The best sunscreens for sensitive skin give you broad spectrum protection from sunburn without causing you to breakout in acne or a rash. The gentlest ones rely on zinc oxide or titanium dioxide instead of chemicals in their formulas. There are many different brands on the market so it can be difficult to choose one. Some are designed to last while you swim, others won’t hold up in water. Others are great for wearing under makeup as a daily moisturizer. Some have a very high SPF rating, but is that even necessary? What is SPF and how much do you need? "Sun Protection Factor" is a measurement that reveals how well a sunscreen blocks UVB rays. UVB (also known as Ultraviolet-B) is what makes your skin burn and/or tan. Too much of it causes certain kinds of skin cancer. Weirdly enough, sunscreens aren’t rated for how well they protect against UVA rays, but those are dangerous, too. Ultraviolet-A rays penetrate deeper into skin than UVB. They can cause different kinds of skin cancer and sun damage like wrinkles. This means that a sunscreen with SPF 15 should protect your skin for up to 7-1/2-hours outdoors. Of course, this doesn’t factor in things like if you’re perspiring or if you’re in water. But you can see why many daytime face creams have this as their default protection level. The highest protection sunscreen you can buy is SPF 100. What does that mean? If you’re pale and burn in as little as 15 minutes, SPF 100 would protect you from UVB rays for up to 1500 minutes, or 25 hours. Most likely, the most you’ll ever need is SPF 50 for a long day on the beach. The United States FDA has approved some chemicals for use against UVA rays. The most common ones are avobenzone, oxybenzone, octocrylene, ecamsule (AKA Mexoryl SX found in L’Oreal products), and Helioplex (found in Neutrogena, a combination of avobenzone and oxybenzone). Some of these degrade in sunlight and/or in water so they need to be reapplied throughout the day for best protection. People with very sensitive skin often find that chemical sunscreens cause them to break out. It’s best to test a small amount on your skin and wait a day to see what happens. Meanwhile, mineral-based sunscreens depend on zinc oxide and titanium dioxide to stop UVA and UVB rays. These ingredients don’t usually cause reactions on sensitive skin or clog pores. They may whiten your skin tone temporarily, but most of them last all day as long as you’re not in the water. Modern formulations are much lighter than the thick cream your local lifeguard may have painted across their nose. Vitamin A, or retinol (or one of its variants like retinyl palmitate) isn’t something you want to have on your skin outside in the sunshine. UV rays interact with Vitamin A, causing damage. Although there are a few skin care products that include both Vitamin A and a sunscreen, most beauty experts recommend avoiding them. If you are treating acne or doing anti-aging treatments with Vitamin A products, please wear one of the best sunscreens when you’re outdoors. It’s time to look at the best sunscreens that will protect your skin from sun damage without harming it with adverse reactions. Blue Lizard Australian Sunscreen is very popular with users who have sensitive skin. It depends on natural sunblockers like 10% micronized zinc oxide and 5% titanium dioxide to give broad spectrum coverage against UVA and UVB rays. 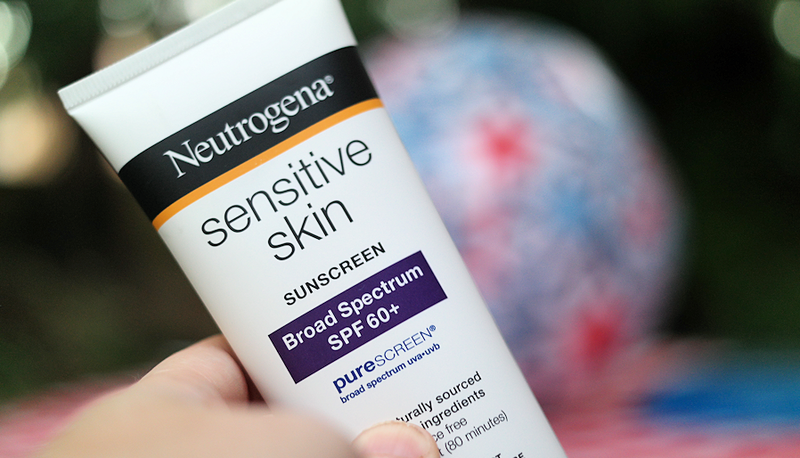 The SPF 30 rating means it’s good enough for all-day protection for fair skin. The formula doesn’t contain the usual skin irritants like fragrances or dye or even parabens. Users say the formula comes out of the bottle a little thick, but rubs in well. It doesn’t seem to turn their skin whiter after it’s been applied. Vanicream’s SPF 30 broad spectrum protection comes from 5% titanium dioxide and 5% zinc oxide and no chemical sunblockers. The formula also contains ingredients to neutralize free radicals that form with overexposure to sunlight. There are no fragrances or parabens because this sunscreen was specifically made to not irritate skin. Banana Boat’s Baby Natural Reflect is based on titanium dioxide and zinc oxide to block UVA and UVB rays naturally. It does not contain parabens or oils so it’s gentle to sensitive skin. It’s also tear-free should you get it in your eyes. It’s good for swimming but will need to be reapplied after 80 minutes in the water, or if you towel-dry it off your skin. The Clear Zinc Lotion with SPF 30 from Babo Botanicals lasts for up to 80 minutes in water or during a workout. It’s safe for both kids and adults to use because it’s based on a non-nano zinc formula. The EWG rates it a #1. It’s even safe to use in ocean water near reefs. While the 18.4% zinc oxide blocks UVA and UVB rays, the organic shea butter, glycerin, chamomile, calendula, and jojoba oil soften your skin and protect against signs of aging. There are no artificial fragrances, no soy or gluten, and no parabens in this sunscreen. Neutrogena formulated the Sensitive Skin Sunscreen to give SPF 60 protection against UV rays that lasts up to 80 minutes in the water. It doesn’t contain oils, PABA, or artificial fragrances. Instead, it has Neutrogena’s Purescreen Technology with zinc oxide and titanium dioxide plus feverfew to calm skin. It’s gentle enough that the National Eczema Association gave it their Seal of Acceptance. The Mineral Fusion Facial Moisturizer with Sunscreen is good for any skin type, for both men and women. It’s vegan and cruelty-free, and does not contain parabens, phthalates, gluten, or artificial colors. The Mineral Fusion formula depends on zinc oxide against UVA and UVB rays. The mineral water base hydrates skin while organic coconut oil creates a natural barrier to protect it. While you can apply it anywhere on your body, it’s designed for faces and can be worn under makeup. Coppertone’s Sensitive Skin SPF 50 Lotion is based on zinc oxide 14.5% plus octinoxate (7.5%) and octisalate (5%). It’s designed especially for skin conditions like rosacea. Coppertone says the formula is fragrance-free and oil-free. It also has no alcohols. Put it on and enjoy the pool for up to 80 minutes before you need to apply it again. This sunscreen by EltaMD blocks both UVA and UVB rays with zinc oxide and octinoxate. It has no oils, no fragrance, and no parabens, and that’s great for sensitive skin. It contains niacinamide, or Vitamin B3, that helps skin with rosacea or acne have better tone and texture. Because of the octinoxate, it needs to be reapplied every two hours. Eucerin says their Q10 Anti-Wrinkle Lotion is made for sensitive skin on men or women and it can be worn under makeup. The light sunscreen protection is based on octinoxate, octisalate, and oxybenzone instead of mineral sunblockers. The combination of these chemicals helps stabilize the formula so it doesn’t need to be reapplied as often. The moisturizing part of the formula contains Coenzyme Q10, Vitamin E, and Beta-carotene to reverse signs of aging. There are no artificial fragrances. Unfortunately, it does contain parabens. If you’d have success using Eucerin products, you may enjoy this sunscreen. MDSolarSciences’ SPF 30 protection is based on avobenzone, octisalate, and octocrylene. The formula has no parabens, no methylisothiazolinone (a preservative that can cause skin reactions), no drying alcohols, no PABA, and no oxybenzone, one of the most likely skin irritants among the chemical sunblockers. The formula also contains other natural ingredients that repair sun-damaged skin and neutralize free radicals. It has Vitamin C, extracts of grape, rosemary, and green tea, hyaluronic acid (a humectant to moisturize dry skin), chamomile, aloe, olive oil, ceramides to even out redness, and caffeine to tighten pores. You can wear it under makeup if you like. La Roche-Posay Anthelios provides protection against UV rays to sensitive skin. It doesn’t contain PABA or other ingredients that clog pores or cause breakouts. Instead, the Anthelios formula of is based on avobenzone, ecamsule, and octocrylene. Vichy Idéal Capital Soleil is made for sensitive skin and can be used on children as well as adults. It’s a lightweight formula that has no oils or fragrances, and no PABA. It’s water-resistant for up to 40 minutes. The SPF 60 protection comes from avobenzone 3%, homosalate 15%, octisalate 5%, octocrylene 5%, and oxybenzone 6%. While it’s very good at blocking UV rays, this mix of chemicals may not be ideal for persons with rosacea or eczema. First off, everyone, no matter how tan or dark-skinned, can benefit from sunscreen. Some of us burn in 15 minutes, others can take up to an hour or more in the hot sun before we feel it later at night. Even if it’s a cloudy day, UV rays can get to your skin. UV-B can’t go through glass, but UV-A can, so even sitting by a window on a sunny day can expose you to rays. Not all UV exposure is bad. Controlled amounts are helpful for stimulating the product of Vitamin D in our bodies. Without Vitamin D, our bones get weak and we feel depressed. If you need more Vitamin D, try being outside without sunblock for up to 15 minutes a few times a week. Too much exposure to sunshine, no matter how nice it feels, can cause sunburn as an immediate reaction, with other damage hidden up to years down the road. Sunburn reaches its maximum redness within 8 to 12 hours after your skin is burned, and takes up to 2 days to fade. But wrinkles, sun spots, and premature aging of the skin can take years to develop and appear. We’ve probably all met someone who was out in the sun a lot, or tanned indoors when they were younger. Many times these people appear older than their chronological age simply because of all the UV exposure that has dried out their skin and damaged the collagen and elastin tissue underneath. Worst of all is skin cancer that comes in these forms: melanoma, squamous cell carcinoma, and basal cell carcinoma. These happen when too much UV light damages DNA and causes skin cells to mutate. This can result in discolored lesions or tumors, and even a fast-growing cancer that can kill. So even if you don’t wear sunblock just to keep from getting a sunburn, or to avoid wrinkles, wear it to keep from getting sick. It’s much better to be a little pale and healthy. If you want to tan, simply take your time and do it as safely as possible. We hope you found the perfect sunscreen today so you can enjoy the summer outdoors. Stay healthy and be happy! Come back soon see new reviews of the top products in beauty and skin care.